Deborah Berke, FAIA, LEED AP is an architect, educator, and the Dean of the Yale School of Architecture. She is the founder of the New York-based architecture firm Deborah Berke Partners and has been a Professor (adjunct) at Yale since 1987. In 2012, she was the inaugural recipient of the Berkeley-Rupp Prize at the University of California at Berkeley, which is given to an architect who has advanced the position of women in the profession and whose work emphasizes a commitment to sustainability and the community. Deborah is a graduate of the Rhode Island School of Design and The City University of New York. In 2005, she was awarded an Honorary Doctorate of Fine Arts from the Rhode Island School of Design. In 2017, her firm received the National Design Award from the Cooper Hewitt, Smithsonian Design Museum. In her conversation with Julia Gamolina, Deborah speaks about finding fulfillment and meaning in all parts of her life - as mother, as architect, and as a teacher - and shares advice for new mothers, entrepreneurs, and young architects. Tell me about your time in architecture school. I had my heart set on going to RISD because I liked that all the other arts were there as well - you made friends across disciplines and really tested your skills. I loved the truly provocative environment – I am a proud and loyal alum [laughs]. At RISD, the architects were the least wild and crazy people on campus, which is usually not the case! 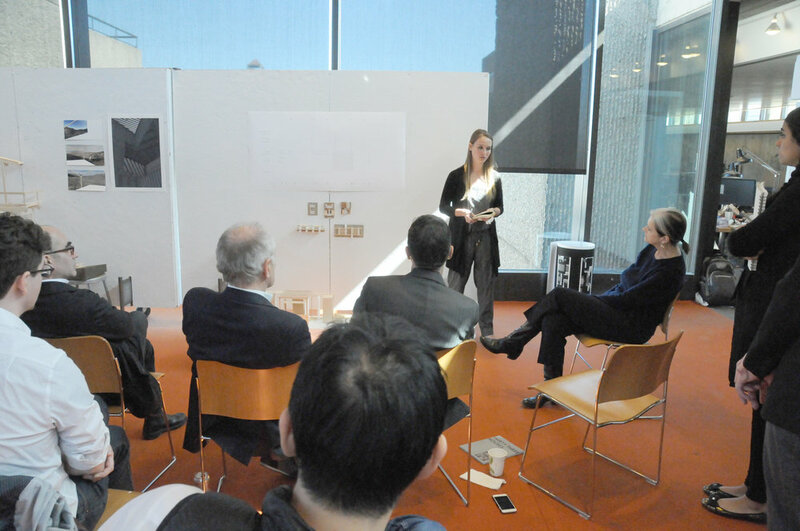 The people in the other disciplines at RISD would be the ones to pull and push architects – “Try this, do that, see that!” – in a way that on many campuses, the architects do for others, as they’re actually the craziest people on campus. There was a recession when I got out of RISD and came back to New York, so I got a job as a graphic designer at an engineering firm – more exposure to different kinds of people, different ways of thinking, different skill sets. I also started hanging out at the Institute for Architecture and Urban Studies. Eventually, I started working at the institute as the administrator of their educational programs, and then taught in those programs. In direct contrast and balance to the artistic training I had from RISD, the intellectual environment at the Institute was incomparable – Peter Eisenman, Tony Vidler, Ken Frampton, Mario Gandelsonas, Diana Agrest, Julia Bloomfield – Oppositions, October, exhibitions, lecture series, all this stuff going on. That played a huge part in making me the kind of person I am today in an academic leadership role. After about six or seven years, I went back to school at the City University of New York, and got a planning degree. Those forces are so significant in influencing architecture – zoning codes, legal codes, real estate transactions, decisions so far beyond what the architect gets to do with their pencil - and architects don’t know enough about them and should so that they have control in shaping the environment. Then I feel like I worked and worked and worked, and built a practice, and tried to weave together my academic life of teaching at Yale with my professional life of getting joy from making and creating. Eventually, late in my life I got married and had a child, but before that I had a very active social life [laughs]. Weaving all those things together in a meaningful way has been the majority of my career. Deborah at a charette in the office. Tell me about integrating motherhood. Integrating motherhood was, has been, and continues to be a challenge of finding enough time to do each thing as well as you can. For example – we didn’t go after work in China when a lot of my colleagues and peers were – because when Tess was home, I set the rule that I would never miss more than two meals in a row at home. Every single day that I was in New York, I had breakfast with my daughter and walked her to school, and I would never miss more than one breakfast in a row. Those rules shaped the kind of work we did and where we did it. We have a lot of work in the middle of the country and cities where my New York peers don’t necessarily have projects. Those rules that I set for myself turned out to be a gift that helped shape the kind of practice we have, though I didn’t know that at the time – I was just trying to figure out how to be a practitioner and do work I believed in and felt that we could do and do it well, and be a good mother at the same time. I imagine that having your own practice helped with motherhood because of the greater flexibility – however, owning a business comes with greater responsibility as well. That’s exactly right - the responsibility is huge, and twice a month it’s really huge, when you have to cut all those paychecks. It’s also huge when you put your employees ahead of yourself in terms of getting paid during tough times – we really try here to have a non-exploitive, fair, respectful, honorable workplace, and that’s really important. The flexibility really mattered before Tess started pre-school. We did have a caregiver, but I breast fed for several years and brought Tess to the office, and later took her to school and playdates, and that was made possible by the flexibility of having my own business. I think when one talks about these issues, you have to acknowledge that most working women – I’m not talking about architects, lawyers, doctors, or those kinds of working women – typically don’t have these opportunities. You are very fortunate when you can set your own schedule and balance that with being a mother. A lot of the women I’ve interviewed are new mothers, but you have a grown daughter. How is motherhood once your child has left home? It’s totally great [laughs]. Having a child at home is a continuum where in the beginning, you know nothing - you’re learning as you run to keep up with your own life. Then it settles into an always changing, yet predictable pattern. For example, summers start by being about finding things to do in the city, and become summers when your child can go to camp, and then eventually they become study programs and then college. There’s a trajectory with structure, but what you do within that structure is always changing as they get older. That progressed over a twenty year period, and was both a busy and a fabulous time. I will say this – I would not have taken the job at Yale if my daughter was still at home. I feel that you can do one thing well, you can do two things well, but there are only so many things you can do well to really be able to give the necessary amount of attention to each. If I did Yale, I could not also have been a mother and a practitioner – something would have had to give. Once a mother always a mother obviously, but I am no longer taking care of Tess every day. Now, Peter and I feel profoundly fortunate that she’s well-launched – happy, healthy, figuring out what she’s going to do with her life - and we can look at our life together and think about what’s next for us. I’m glad you mentioned your husband Peter – how does marriage integrate into everything that you do? It’s such a prominent part of people’s lives that is sometimes left out of these conversations. I have a wonderful marriage with a great guy who is a good man. We married late in life and I was almost 40 when our daughter was born. We were relatively well-formed in our careers by the time we got married and that was a good thing. We have a lot of mutual respect and do a good job of supporting each other emotionally – we were friends for 27 years before we got married, truly friends. Our friendship is key to the success of our marriage, and we have been friends now been for more than 50 years! It’s important to genuinely like your partner, especially for the long haul, because life has ups and downs and things get very complicated as you get older. I’m trying to make room for my personal creative undertakings – drawing and things I do at home and on the weekends - which have been ignored for several decades. I’m trying to amp that up again as I look towards what my future will hold. You’ve reached incredible milestones in both practice and academia – how do both work together? With my job at Yale, I’m not around in the office the way I used to be. I still work a gagillion hours, but I’m not as physically present. That’s certainly a transition, though maybe a healthy transition in a number of ways. I think the work I’m doing at Yale is important and I also feel that being at Yale and having responsibilities there is actually a gift to the people here in the office. It gives them more openings and greater opportunities to further their careers at the firm, and move the firm forward in directions that I might not have thought of. I think that’s great and I try to be really supportive of that. What has it all taken? To get to where you are as a practice, to get to where you are at Yale. I do work a lot - I have a lot of energy and I don’t get tired. I feel lucky that I have a healthy, 96-year-old mother, so I hope it’s genetic [laughs]. I’m also an optimistic person – I see the good in most things. That isn’t to say I am not politically energized and profoundly concerned for the future of this country and the future of the planet, but with that said, I’m still an optimist and I just keep on keeping on. Looking back broadly, what have been some of the biggest challenges? Since we just talked about marriage, on a personal level, when I was in my twenties, my attitude was, “I’m never getting married.” My parents had a very long and happy marriage, so I don’t know where that came from. When I got into my thirties however, knowing that if I was going to be a mother, I needed to move past that. That shift was challenge – I needed to wrap my head around what I wanted my life to be like over the next four decades and how to get a personal life and a professional life that were in a happy and supportive balance of each other. I am most proud that with my marriage, my family, my role as a mother, my role as a Dean and a teacher, and my role as a practitioner - a maker, a creative visionary, and runner of a business - that I have managed in all of those things to be an honorable and generous person no matter what, and to hold myself to that standard no matter what the payoff or the temptation of lowering that standard would be. What advice do you have for those wanting to start their own practice? There was a sociologist who taught at Princeton in the architecture school and studied architects. He said to me early on in my career, “There are three aspects to the practice of architecture – getting the work, doing the work, and running the business – and nobody can do all three.” So, a young practitioner needs to be able to recognize those things – where is the work coming from, how are you doing it, and are you getting paid and making sure you pay your staff or your consultants. Since you can’t do all three – many people can do two – figuring out who you are going to work with is important so you can run the best possible practice and that all aspects of being an architect can be addressed and not be causing stress that gets in the way of the quality of the work, the creativity, or the service you provide. What advice do you have for mothers? A child that has a working mom is a healthy thing. You want your child to see you doing something that is meaningful to you, and also that you can provide for yourself. The second part is shaping your career so that you can be a good and present mother is key. There are many ways to do that and no one size fits all, but it’s especially important to help mothers with young children do that, so that they don’t leave architecture, as that’s such a tender time. For some mothers, they may have a small practice while their kid is at home that expands as school comes on; for others it might be a large practice where they’re an employee but it’s a big enough practice where part-time work is possible; for others it might be teaching which has a very reliable schedule so that you can arrange for a part time daycare. There are lots and lots of different ways to shape it. What advice do you have for young architects? There’s no obvious first step. Should you go work for a great master? Should you get a job that allows you to pay off your student debt as quickly as possible? The thing that you should do though is to work somewhere long enough to get something out of it and then to recognize when you’ve learned all you can, whether it’s a year or ten years. I’m not encouraging a new job every six months or anything like that, but when you see that the trajectory within a certain job is no longer bringing new things to your mind and no longer challenging you, think about what the next job should be, what was missing from your last, what the right balance is. Even as a young architect, one should make sure to gain fulfillment at each stage of what you’re doing. My approach is that I’ve tried – since the time one is actually aware of these things, and god knows when that is, because it’s certainly not at fifteen – to live generously, live honorably, get fulfillment from what I do, and look for fulfillment and meaning more so than for happiness. How do you personally distinguish between fulfillment and happiness? Happiness is good, but being happy is momentary, fleeting, and can be superficial. That beautiful moment of a sunset is a moment and you feel great and you turn to your friend and say, “Isn’t that gorgeous,” and then it’s gone and you can’t keep it. When your life is meaningful or fulfilling, it’s a substance. I’m not a religious person, but maybe that meaning is actually the food for your soul and stays there, and that’s what I’m looking for. So to answer the impossible question you just asked about approach [laughs], I think it’s about finding fulfillment and meaning in life in a way that keeps your soul sated. 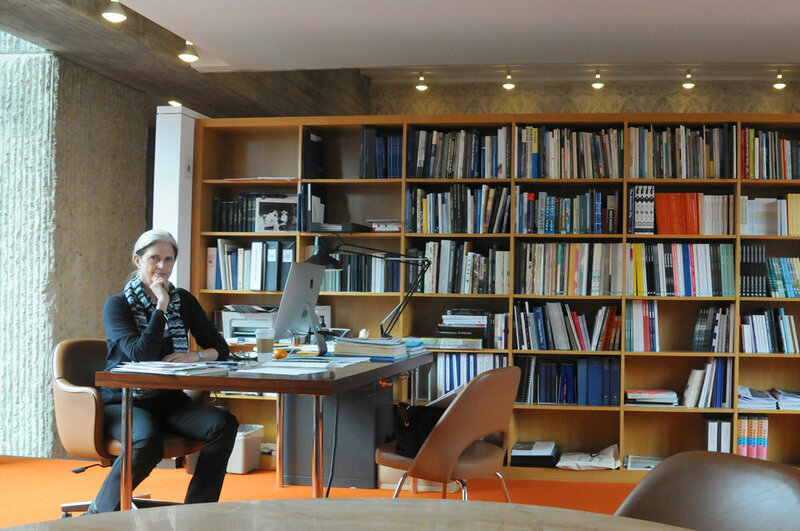 Deborah in the Dean's Office at the Yale School of Architecture.